This Caprese Salad is as simple as it gets. A great starter for any summer lunch or dinner. It is always a hit on the table and can be made in just a few minutes. Cut the fresh mozzarella in slices and place them on individual serving plates. Layer finely sliced tomatoes in between mozzarella slices. 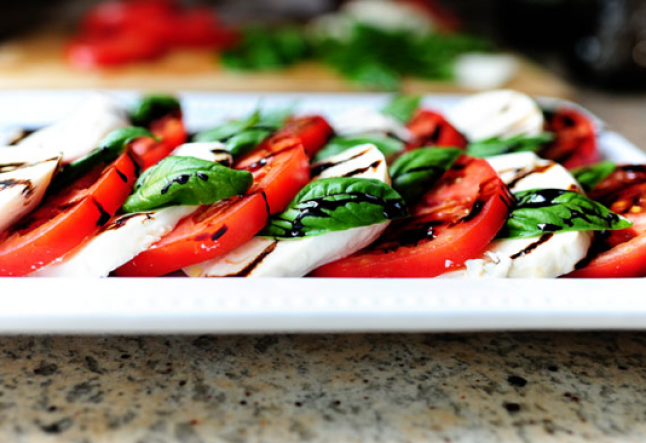 Decorate with basil leaves and drizzle olive oil on each plate with a few drops of balsamic vinegar. Presto! Serve all ingredients fresh and slightly cool.